IIOIOIOII (pronounced I.O.) AKA Christopher Gurney is a new name in the scene with only one full-length album under his belt. 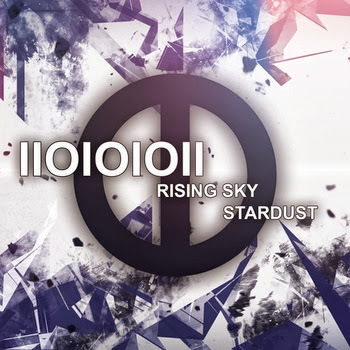 But his new EP 'Rising Sky' / 'Stardust' shows that he'll soon be well known. Blending the likes of John Foxx, Gary Numan and Depeche Mode with the grittiness of Skinny Puppy and Acretongue, Gurney crafts a melancholic, sinister and entrancing take on synthpop. The opening track 'Rising Sky' is a pure 80's crossover with nods to the likes of 'With Sympathy' era Ministry, Gary Numan and Skinny Puppy. The B-side, 'Stardust' is borderline psychedelic with Gurney's melancholic vocals becoming almost hypnotic over the cold space-age melody. 'Could Have Been' continues the hypnotic vocals but over a minimalistic blend of John Foxx-meets-Fad Gadget inspired electro that is begging to be let loose on the dance floor. The final song, 'Good Night', gets a little darker with it's harder beat, and synths reminiscent of early Skinny Puppy complimented by sinister whispered vocals. The four songs compliment each other nicely, steadily getting darker as they progress. Which shows off a strong level of vision that is ultimately carried through to the mix, with each song constructed with great care. This is a very promising glimpse of things yet to come. Despite being an unknown artist, Gurney demonstrates a mastery of his craft that blends the darker side of synthpop with the lighter side of electro-industrial in a modern way. And without pandering to a misplaced sense of “Retro for retro's sake”. This is strong and relevant work that hints at great things to come.